These study guides, part of a set from noted Bible scholar, John MacArthur, take readers on a journey through biblical texts to discover what lies beneath the surface, focusing on meaning and context, and then reflecting on the explored passage or concept. With probing questions that guide the reader toward application, as well as ample space for journaling, The MacArthur Bible Studies are invaluable tools for Bible students of all ages. This work on Ephesians is part of a New Testament commentary series which has as its objective explaining and applying Scripture, focusing on the major doctrines and how they relate to the whole of the Bible. ^take readers on a journey through biblical texts to discover what lies beneath the ^surface, focusing on meaning and context, and then reflecting on the explored passage ^or concept. With probing questions that guide the reader toward application, as ^well as ample space for journaling, The MacArthur Bible Studies are invaluable ^tools for Bible students of all ages. This work on Ephesians is part of a New Testament ^commentary series which has as its objective explaining and applying Scripture, ^focusing on the major doctrines and how they relate to the whole of the Bible. Ephesians has rightly been titled the believer's bank and the treasure ^house of the Bible. This beautiful letter tells Christians of their great ^riches, inheritance, and fullness in Jesus Christ and in His church. It unfolds ^for them the infinite blessings they possess in Christ and how they can claim and ^enjoy those possessions. Join John MacArthur as he explains each verse in ^a way that is both doctrinally precise and intensely practical. Ephesians has rightly been titled the believer's bank ^and the treasure house of the Bible. This beautiful letter tells Christians ^of their great riches, inheritance, and fullness in Jesus Christ and in His church. ^It unfolds for them the infinite blessings they possess in Christ and how they can ^claim and enjoy those possessions. Join John MacArthur as he explains each ^verse in a way that is both doctrinally precise and intensely practical. The ^MacArthur New Testament Commentary series comes from the experience, wisdom, and ^insight of one of the most trusted ministry leaders and Bible scholars of our day. ^Each volume was written to be as comprehensive and accurate as possible, dealing ^thoroughly with every key phrase and word in the Scripture without being unnecessarily ^technical. This commentary will help to give a better, fuller, richer understanding ^of God's Word, while challenging the reader to a vibrant personal spiritual walk. JOHN MACARTHUR is the pastor-teacher of Grace Community Church in ^Sun Valley, California, president of The Master's College and Seminary, and featured ^teacher with the Grace to You media ministry. Grace to You radio, video, audio, ^print, and website resources reach millions worldwide each day. Over four decades ^of ministry, John has written dozens of bestselling books, including The MacArthur ^Study Bible, The Gospel According to Jesus, The New Testament Commentary ^series, The Truth War, and The Jesus You Can't Ignore. He and ^his wife, Patricia, have four married children and fifteen grandchildren. "Clear, reasonable, ^understandable, devout-all things and more can be honestly said about this generation's ^greatest single-author pastoral commentary set. The MacArthur New Testament Commentary ^series is a help to Christians and preachers. Forged in the study, fired in the ^pulpit, these comments on the whole New Testament are a gift from one who loves ^Christ, given to Christ's bride, the church." -Mark Denver, pastor, Capitol Hill ^Baptist Church, Washington, D.C.
"Dr. MacArthur's love for the Scripture and ^his many years of diligent study have resulted in a resource that is a great gift ^to the Body of Christ. I have found this tool to be a great help as I study the ^Word and teach it to women. I often refer to this set of commentaries to enhance ^my understanding of the text and to shed light on difficult passages and questions." "John MacArthur ^has provided a compelling example of pastoral ministry based on the Word of God. ^Now the fruit of that ministry is available to us all: careful attention to the ^text of Scripture and faithful theological exposition, all in the service of the ^church of Jesus Christ. Both pastor and layperson will benefit for years to come ^from this unique commentary series." "The MacArthur New Testament Commentary is nothing less than a ^library of faithful exegesis and exposition. This project is unparalleled in our ^times, and John MacArthur has produced a masterful commentary series that demands ^attention and deserves a place in every preacher's library." Clear, reasonable, understandable, devout-all things and more can ^be honestly said about this generation's greatest single-author pastoral commentary ^set. The MacArthur New Testament Commentary series is a help to Christians ^and preachers. Forged in the study, fired in the pulpit, these comments on the whole ^New Testament are a gift from one who loves Christ, given to Christ's bride, the ^church. -Mark Denver, pastor, Capitol Hill Baptist Church, Washington, D.C.
Dr. ^MacArthur's love for the Scripture and his many years of diligent study have resulted ^in a resource that is a great gift to the Body of Christ. I have found this tool ^to be a great help as I study the Word and teach it to women. I often refer to this ^set of commentaries to enhance my understanding of the text and to shed light on ^difficult passages and questions. John MacArthur has provided a compelling example ^of pastoral ministry based on the Word of God. Now the fruit of that ministry is ^available to us all: careful attention to the text of Scripture and faithful theological ^exposition, all in the service of the church of Jesus Christ. Both pastor and layperson ^will benefit for years to come from this unique commentary series. The MacArthur New Testament ^Commentary is nothing less than a library of faithful exegesis and exposition. ^This project is unparalleled in our times, and John MacArthur has produced a masterful ^commentary series that demands attention and deserves a place in every preacher's ^library. 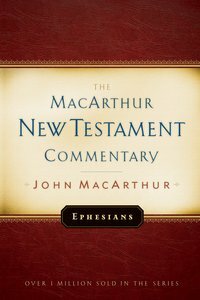 About "Ephesians (Macarthur New Testament Commentary Series)"